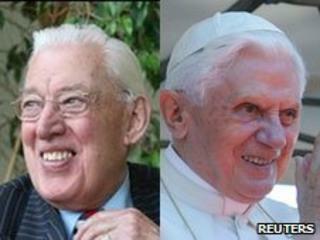 Ian Paisley has said it was a "mistake" to invite Pope Benedict XVI to Britain. The Pope's trip in September will be the first official state visit by a Pontiff to the UK and the first papal visit since John Paul II in 1982. Speaking ahead of his formal elevation to the House of Lords next week, the former DUP leader said: "I think he should not be invited to the country." Mr Paisley, who has a history of denouncing the Catholic Church, said abusing priests were "anti-Christ". "We have had a terrible happening in Ireland with the priests and monks and nuns all taking part in acts of disgraceful behaviour with young people, and we haven't seen the Catholic Church taking a strong stand on this," he told the BBC World Service. He added: "A person, like some of the priests we've had, destroying the lives of young people and then going out and saying 'I can forgive sins', it's only right that be called what it is. "That is anti-Christ in teaching and in doctrine." The 84-year-old former Northern Ireland first minister said arrangements for the Pope's UK visit had been made in "secret". "Nobody knows who made the thing; you go and ask a question of any minister and he says he doesn't want to have anything to do with it," he said. "The Queen is only meeting them on Scottish soil, not on English soil." The Pope's itinerary includes a reception with the Queen at Holyrood House in Edinburgh and open-air Masses in Glasgow, Birmingham and London. He will also attend a celebration of Catholic education and a meeting with the Archbishop of Canterbury in London. Mr Paisley first attracted major public attention in 1963 when he organised a protest march against the decision to lower the union flag at Belfast City Hall to mark the death of Pope John. Famed for his firebrand oratory, Mr Paisley was a founding member of the Free Presbyterian Church in Ireland in 1951. In 1988, he caused anger among fellow MEPs when he interrupted an address by the late Pope John Paul II in Strasbourg. Mr Paisley denounced the Pope as an "anti-Christ" before being bundled out of the chamber by some scandalised colleagues. His evangelical theology heavily influenced his political views and throughout the Troubles, he denounced Catholicism and the papacy. For many years, he was a fierce critic of power-sharing with nationalists and of the Republic of Ireland having a say in Northern Ireland's affairs. But in his later political life, the hardline unionist shifted towards an accommodation which in 2007 saw him enter office with his long-time enemy, Sinn Fein. Mr Paisley stood down as first minister in 2008, to be replaced by his long-serving deputy, Peter Robinson. Next Monday he will join his wife Eileen, who was made a baroness in 2006, in the House of Lords, where he will be known as Lord Bannside of North Antrim.